Every once in a while customers call us at Kiddie Toys, and tell us that they are seeing "unauthorized" credit card charge(s) on their bank account. Customers attempted to place an order online, and the credit card declines for some reason but the bank account of a buyer shows that the charge went through. We (merchant) look up our payment gateway and see multiple "declined" transactions. Customers ask us to remove the charge(s) for those transactions that were never approved in the first place. So, what is going on here? Let's start out with customer's question and merchant's response. Q. I (buyer) have tried to purchase an item online, but my credit card was declined. However, when I call my bank they are telling me the charge went through. My credit card company tells me that your company double charged my credit card, and you (merchant) are telling me the order didn't go through. I trust my bank, so please remove the charge(s) from my bank. A. The merchant is telling you the transaction was declined, and your bank is telling you it has been approved. Yes, your bank approved the transaction but the merchant's payment gateway declined the transaction so the entire transaction was declined even though your bank approved it. Merchant's payment gateway may have security settings which may have triggered a decline such as address and zip code verification. It is the way how the banks operate, so it's not your fault nor merchant's fault. The merchant cannot remove the charge since it was never approved, so please do NOT ask merchant to remove this charge. The charge will be on "pending" state, and the money will never be taken out of your credit card account but the reserve will be put aside so it will reduce your credit limit until the transaction clears on it's own within 2-5 business days. The bank will say "ask the merchant to call in to cancel this transaction", but a merchant CANNOT call in on your behalf as the credit card companies will not share account information with non-account holders such as a merchant. 3. If the transaction is approved by your bank, now the transaction is once again go through a security check by the payment gateway company with billing information sent by the issuing bank. If customer entered address, zip code and card code do not match with the credit card billing information provided by the issuing bank, the payment gateway may decline the transaction based upon merchant's fraud security settings. This is the reason why your bank says it's approved, and your merchant says declined -- and, they are both right!! Your bank approved the transaction, but the payment processor declined the transaction. To conclude, the net result of transaction status is a failure as the payment processor declined the transaction even though your bank approved it. This transaction will NOT show up on your credit card statement as it is declined by the payment processor. To your bank, they'll see this transaction as approved and will temporarily hold ("reserve") this money until the payment processor claims the money (which will never happen as it is a declined transaction), or a specific time elapses with no action from the payment processor which then releases the reserve. The time it will take to release the fund varies from banks to banks, and it could take anywhere from 2-7 business days. Why would payment gateway company scan a security check and decline the transaction when the issuing bank already approved the transaction? Credit card fraud is one of the fastest growing crimes as more and more people are buying products and services online. When fraud occurs, the banks get their money back from the merchant and the customers get their money back from the banks (with a bit of hassle). It is the merchant who will lose money on fraudulent transactions. To protect merchants and buyers, payment gateway providers implemented additional security check to prevent "possible" fraud. Note: You may reproduce and distribute contents of this article provided that you give a full credit to the author ("Scott Seong"), and provide a backlink to this page from your webpage. The content shown below is borrowed from Authorize.Net, and we do not have an authority to grant permission to redistribute it's content. 1. The merchant submits a credit card transaction to the Authorize.Net Payment Gateway on behalf of a customer via secure Web site connection, retail store, MOTO center or wireless device. 2. 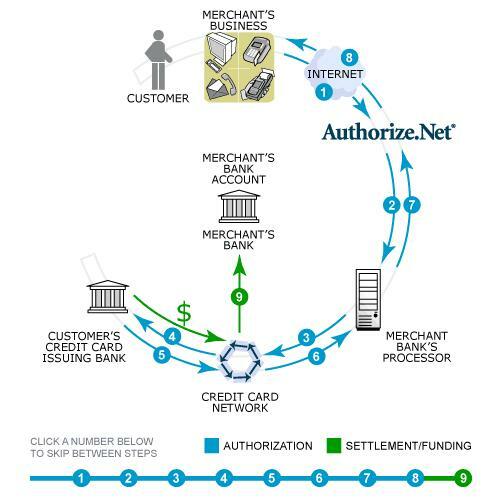 Authorize.Net receives the secure transaction information and passes it via a secure connection to the Merchant Bank's Processor. 3. The Merchant Bank's Processor submits the transaction to the Credit Card Network (a system of financial entities that communicate to manage the processing, clearing, and settlement of credit card transactions). 4. The Credit Card Network routes the transaction to the Customer's Credit Card Issuing Bank. 5. The Customer's Credit Card Issuing Bank approves or declines the transaction based on the customer's available funds and passes the transaction results back to the Credit Card Network. 6. The Credit Card Network relays the transaction results to the Merchant Bank's Processor. 7. The Merchant Bank's Processor relays the transaction results to Authorize.Net. 8. Authorize.Net stores the transaction results and sends them to the customer and/or the merchant. This step completes the authorization process – all in about three seconds or less! 9. The Customer's Credit Card Issuing Bank sends the appropriate funds for the transaction to the Credit Card Network, which passes the funds to the Merchant's Bank. The bank then deposits the funds into the merchant's bank account. This step is known as the settlement process and typically the transaction funds are deposited into your primary bank account within two to four business days.